In honor of September, I'm giving away a copy of my ebook, Autumn Crone, to everyone who leaves a comment below! This is my only book set in Autumn. 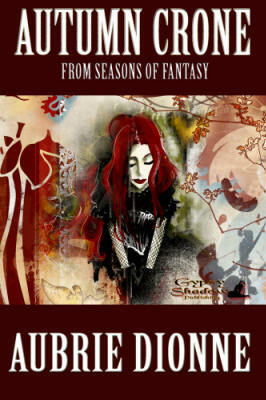 Autumn Crone is the least known of my Seasons of Fantasy Series, and perhaps the most overlooked. Each season deals with a different part of life: Spring is a young maiden, summer is a woman in the prime of her life, and autumn is an older woman, looking back on the past. Her years have made her wise, and she tries to convince a younger woman not to make the same mistakes. This is the back story for Winter Queen, the most famous of the set, bringing the series in a full circle. To win a copy of Autumn Crone, please leave a comment below with your email stating your favorite part of the autumn season. Well, my birthday is September 2nd. Although that's technically still summer, I think of it as fall because of going back to school right around then. Doesn't count? Ok, then football! Go Eagles! I loved these stories. Don't count me in the giveaway - I've read them. Eagles, Nicole? I come from a family of Eagles fans. My favorite part is Halloween. Don't enter me either as I've already got it. But whoever wins is in for a lovely read.